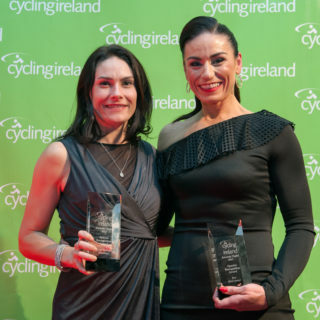 26th November 2017 The cream of Irish cycling flocked to Santry last night for one of the biggest events on the Cycling Ireland calendar – the Cycling Ireland Awards Night. The annual event is a true celebration of the Irish cycling community, with awards being presented for cycling achievements across the spectrum of the sport. In 2017 Irish cyclists won over 20 medals at World and European level, with most present to reflect on what has been a tremendous year, and reveal their future plans. With this year coming to a close, plans are already being made by riders like double world champions Katie-George Dunlevy and Eve McCrystal, who indicated they are planning on defending their title in 2018. Online members of the cycling community who were unable to attend participated in an interactive online experience of the awards night through the hashtag #CIAwards.